The far-right anti-Muslim movement ‘Pegida’ is to hold its first rally in the UK this month, capitalizing on its growing support across Western Europe. The group, whose name stands for “Patriotic Europeans Against the Islamization of the West,” has garnered thousands of followers in Germany, with more than 25,000 joining its rally in Dresden last month. The group plans to hold rallies later this month in Newcastle and Birmingham, with a London march later this year. 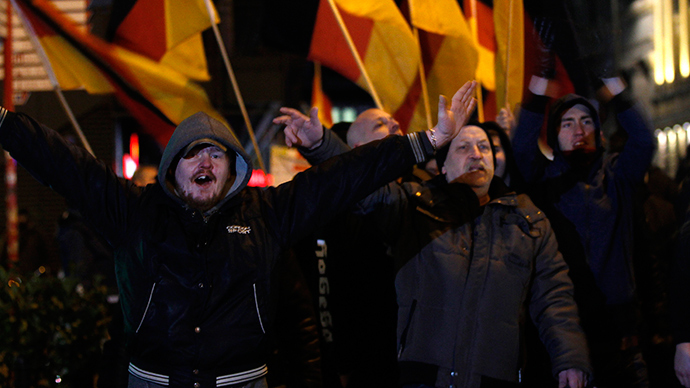 “Pegida UK is holding its first rally in Newcastle. All are welcome to attend. Let’s show the Islamists we show no fear,” the group wrote on its Facebook page. While Pegida hasn’t made an official comment to any British media, a spokesperson did tell the Mirror it was not acting illegally, and they expected between 500 to 3,000 protesters to attend the marches. “We are against radical Islam, hate preachers and believe Muslims need to adapt to our way of life in the West instead of us adapting to them,” the spokesperson said. Pegida’s rise comes in the wake of large numbers of anti-Muslim groups emerging in mainland Europe, whose members also express other grievances, including a lack of jobs, benefit cuts and a shortage of public housing. The group is also similar to British anti-Muslim organizations such as the English Defence League (EDL) and Britain First, who cultivate members on social media. According to official data, Pegida’s UK support page has been ‘liked’ more than 12,000 times, with a huge surge in support after the terrorist attacks in Paris last month. However, analysis from the BBC shows that around half of the ‘likes’ on Pegida’s Facebook page come from internet users in Germany, which may cast doubt on the true level of public support for the group in the UK. Northumbria Police, who will provide security during the Pegida march in Newcastle, said they had not been contacted by the organization. “At the moment we have not received formal notification from this group about a proposed march,” a spokesperson said. However, a number of anti-fascist groups are already planning to resist the march, labeling the group racist and Islamophobic, at the same time as voicing concerns over violence toward members of the general public.